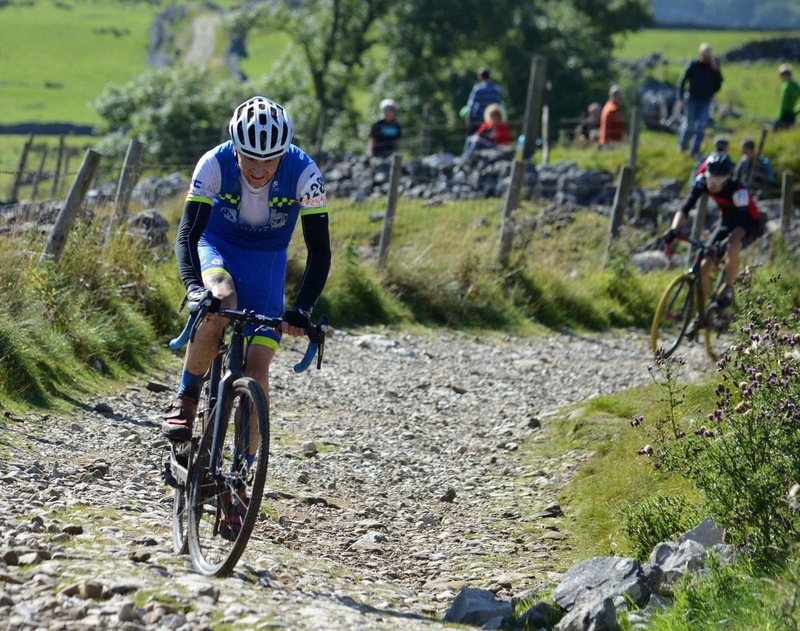 The Three Peaks Cyclocross. A game of three thirds. Anxious to avoid a repetition of last year where I basically did too much, this year I decided to give the summer cross a miss (mostly) and fix upon a limited number of goals. The first date in my diary is the Derby National Trophy, so clearly that hasn’t happened yet. Conspicuously, the Three Peaks was absent from my goal list this year, although I still entered it because, well, that’s what you do on the last Sunday in September isn’t it? I’ve not ignored training for the ‘peaks. I knew when it was in the diary, but kept its unique requirements to the back of my mind. I’ve trained for the cross season, and an early showing at Northallerton showed some promise if things keep going in that direction. I’ve kept running over the summer. But, aside from one big day out on the cross bike up to the foot of Blea moor and a run up Whernside in late August, I’ve not done the stuff you really need to do. Good 4-5 hour off road rides over hills on a cross bike. Carrying the bike up steep steps. Partly through ambivalence, partly through my training being largely done on the commute to work. 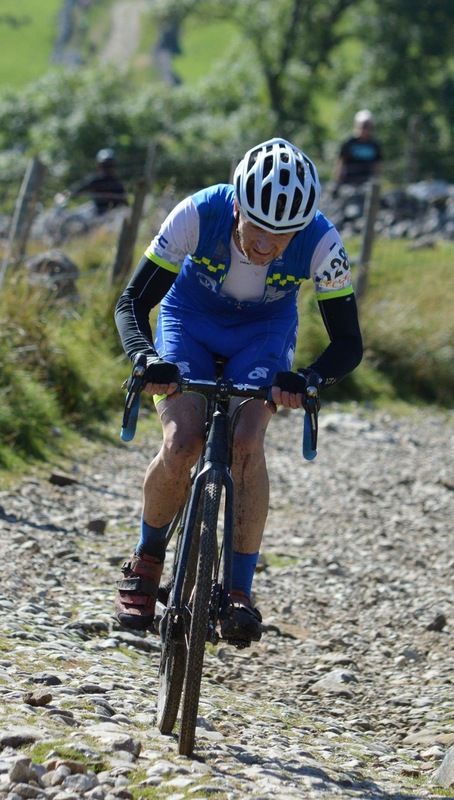 I’m not complaining, I feel pretty good for the coming cross season, but there was always going to be a price to be paid come the end of September, at the foot of Ingleborough. 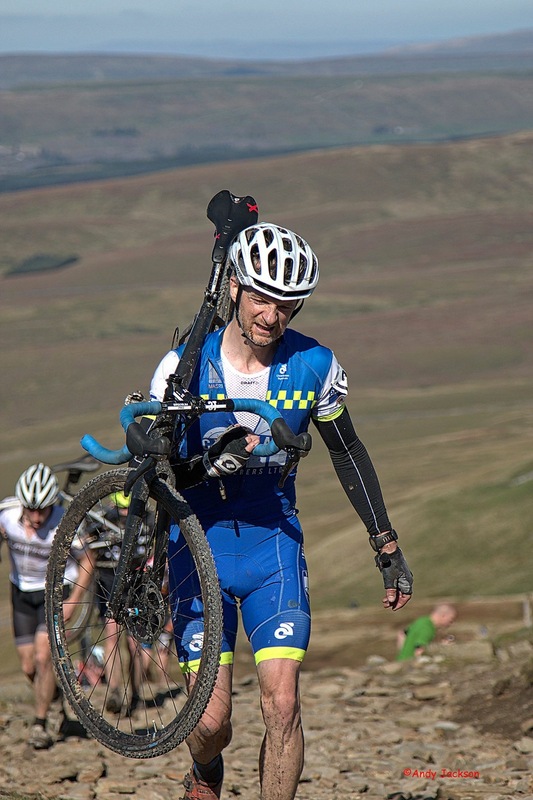 There are three aspects to a good three peaks ride. General fitness, three peaks fitness and mental strength. I had the first but lacked the second two. Having not given sufficient consideration to the race, I wasn’t ready to meet the challenge that it brings – and suffered hugely for it. I had a good start. Well positioned after the regulation amount of jostling. It was quite a fast start behind the car. I was well up towards the front, so there were fewer people to get caught behind if there was a crash. Also, it wasn’t as nervous. 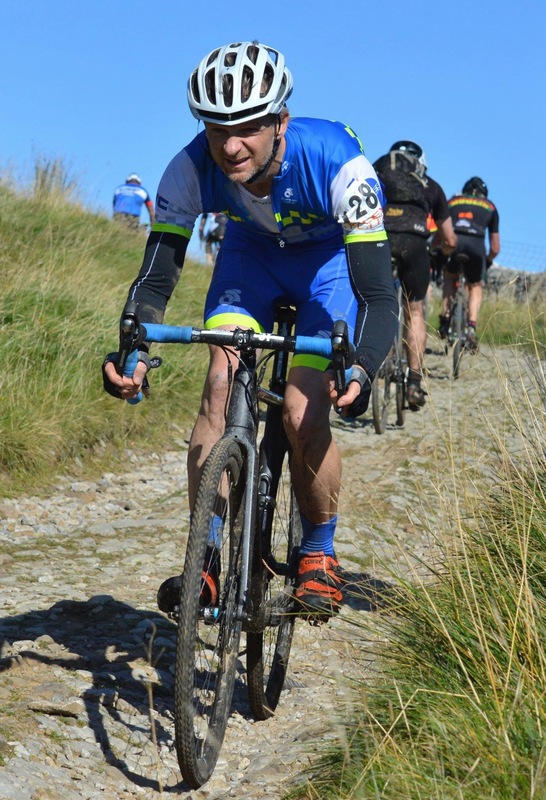 I managed to get on Doug Hart’s wheel (Ilkley CC). He is the same size and has roughly the same power output as Stijn Vandenberg, which was handy. Like being motorpaced by an outside privy. I was not totally knackered by the time we headed up to the Farm at Gill Garth. As I result, I didn’t lose many places up to the bottom of Simon Fell. Apart from the excruciating pain in my calves going up Simon Fell, I wasn’t noticeably slower that those around me going up to the top of Ingleborough. The climbs up Whernside and Pen-y-Gent weren’t too bad. By that I mean that I didn’t lose too many places. A few, but at least there weren’t swarms of people confidently storming past me up the steep steps of Whernside. Also, the rideable parts of Pen-y-Gent were ok. Not brilliant, but I was pacing myself pretty well. I did get the sense though, that there were quite a few people breathing down my neck at this point. I wasn’t ready for it, or up for it. I came down off Ingleborough like a bag of washing. I don’t know whether I had no appetite for it or I’m getting scared in my old age, but I didn’t have great flow. When I got onto the road at Cold Coates I was fine, but on the road to Chapel le Dale, I let the wheel of the rider in front go. I could have held it for a bit more effort and stayed with that group of about 4 riders to the rise, but I didn’t have it in me. As a consequence, I probably lost a few minutes. And my chin went down a bit. It’s not that I wasn’t trying, but I wasn’t trying hard enough. I was just getting ‘round. There was no flow to the descent off Whernside either. It wasn’t a bad descent. I didn’t have an off and I was only running with the bike three times, but the lack of preparation for riding on slabs, bog and rocky paths really told and it felt awkward. There was also a marshall at the stile who was preventing people using a faster route down a boggy bank, which put me in a bad mood. The road section from Ribblehead to Horton is also best forgotten. Again, I lost the group of riders I was with. Again, it was lack of willpower rather than lack of firepower. I soloed to Pen –y- Gent lane and felt ok going up. The descent was generally alright. I found the narrow path above the upper footpath. The steep section off the top path seemed steeper and gravellier than usual so whilst not exactly tentative, I was not 100% committed as in previous years. Maybe I’m getting less brave in my old age. I had an off half way down. Luckily not a yard sale type off, but a slow speed slip on loose rock that caused a dropped chain and a general cheer in the crowd. And the cramps. I’ve had a bit of cramp of the road down to Horton and on the road to the finish before, but not like this. It started at Cold Coates. It wasn’t constant, but was constantly there in my mind, waiting to attack. I don’t usually get cramps doing any other form of cycling or running. But I suppose the three peaks isn’t any other form of cycling or running is it. I’ve just reread this and it reads like I didn’t enjoy it. I wasn’t buzzing at the end in the way that I have done in the past if I’ve had a good race, but that doesn’t mean I didn’t enjoy it. I had a blast. It seemed to go by quicker this year, but conversely, because I had some moments where I decided to stop going full gas, I had some brief seconds to reflect on the sheer madness and brilliance of it all. The crowds were absolutely brilliant. There can’t be many experiences in any sport like dropping off Ingleborough into a crowd of cheering supporters and out onto the quiet of the road immediately after. It’s a similar experience at Ribblehead, magnified. There is a wall of sound from the spectators at the bottom of Pen-y-Gent lane that pushes you up that difficult lose stoney section. The offer of bottles of water and the calling out of your name. They all stay lodged in my memory, even if I had no idea at the time who offered liquid or shouted ‘Dig in, Mike !’. You can’t really enjoy the scenery (although more than a few have mentioned how they noticed the incredible temperature inversion to the south of Ingleborough this year), but that’s irrelevant. You are in the scenery. Immersed in it. It’s the constant moving backdrop to the day. After the finish its also great just to sit in the field and relive the race with your mates. Exchange war stories and commiserate over mechanicals or crashes. And of course after all that is over, it’s time for fish and chips in Settle. And after all that ? Two minutes slower than last year. About what I expected given I hadn’t managed to fulfil the triumvirate of peaks prep. I’m fitter than last year, but not in the right way and it told. Thinking aloud about music & cycling. Expecting neither to be right, nor listened to.